We should revisit automatic registration and voting by mail and take up the challenge of online voting. It’s been more than a week now, and there’s been plenty of handwringing about the record-low 34.8 percent turnout for the Aug. 13 primary election. In partial defense of apathetic voters, let’s be honest: The ballot wasn’t exciting. On the other hand, adult, civic duties don’t necessarily have to be exciting to be taken seriously. How do we move toward the more participatory democracy that Hawaii deserves? How do we rekindle the enthusiasm that existed 50 years ago, when primary voter turnout routinely came in north of 70 percent throughout our islands? The introduction of online voter registration is one of several modest steps Hawaii has taken to improve voter participation. 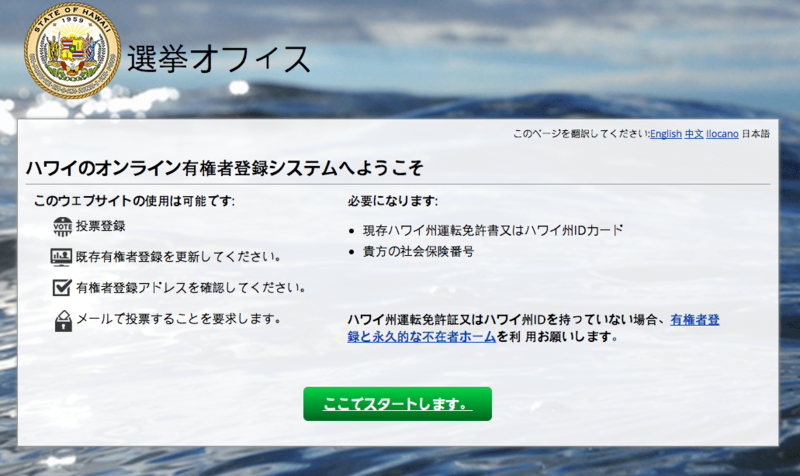 It is available in multiple languages, including Japanese. From 1959 to 1992, there was only one Hawaii primary election (1984) in which turnout dropped below 60 percent; nine times during that period, it exceeded 70 percent, including 1959’s historic high of 84.4 percent. But since 2000, primary turnout has not exceeded 43 percent and twice in the last eight years has fallen below 40 percent. That’s a problem. In most cases, these elections are Hawaii’s most critical and influential. Because of the state’s overwhelmingly Democratic voter base, most races around the state are decided in the primary. Many Democratic nominees wind up either unopposed or not meaningfully opposed in the general election. Democracy is at its healthiest when there is strong citizen participation, when many voices are heard through the ballots they cast. We have nothing against the Democratic Party, but when one political organization so completely controls the reins of power — without competition that pushes it, checks it and keeps it honest — that imbalance can become unhealthy. Hawaii has already shown interest in reform. In 2014, the state passed a bill allowing same-day voter registration and it is slated to kick in with the 2018 elections Last year, online voter registration for state residents was introduced and seemed to be a good tool this year. But bills to convert entirely to a vote-by-mail system were narrowly defeated in 2015 and this year, along with legislation enabling automatic registration. Other states and countries have been innovating around similar challenges, and their examples provide a menu of options. Hawaii’s elected officials and community organizations should look at these possibilities now, while the sting of the primary turnout is still fresh and far enough in advance of the 2017 legislative session that support for change can take root. Last year’s launch of online voter registration was a step in the right direction. Putting some muscle behind promotion of the different ways to register is the necessary next step. Right now, most of the promotional effort revolves around simply reminding would-be voters about deadlines for registration in advance of elections. More energy must be put into registration drives when the chance to vote isn’t just around the corner. That should happen through the state Office of Elections, as it does in other states that have robust voter outreach efforts aimed at getting people excited about participating. But it also should involve community organizations already heavily invested in voter registration efforts and outreach. It will be another two years before the same-day voter registration will be available. Meanwhile, legislators should revisit the automatic registration bill that died this year. The House passed the legislation only to see it stop in Senate Ways and Means. Lawmakers must resolve their differences so that anyone applying for a driver’s license or a state ID card is automatically registered. Difficulty in getting to the polls is the main impediment for many voters. Hawaii’s allowance for voting by mail allows voters to request absentee ballots, either in advance of a particular election or for all elections. Oregon conducts its voting entirely by mail, with strong results: 54 percent of registered voters turned out for the state’s May primary, and over the last 16 years Oregon’s general election turnout has ranged from 69 percent to 86 percent. A bill that would have incrementally phased in voting by mail statewide by 2022 passed the Senate earlier this year, but stalled in the House. There’s simply no good reason, in a state where many voters face transportation or traffic issues in getting to polling places, that we shouldn’t follow the proven example of other states in submitting our ballots via the U.S. Postal Service. As we consider that opportunity, it’s time to begin discussions on another that is fast becoming increasingly viable: Online voting. So much of the business of our lives today is conducted online. We pay bills, do our banking, earn college degrees, apply for loans and transact other serious business on our computers, tablets and smart phones every day. Why shouldn’t voting take place in the same environment? Security concerns and the inability to verify accurate results have been seen as stumbling blocks. But online voting has been in effect in Estonia for a decade and is now in place in a more limited fashion in India. In its 2015 report, The Future of Voting: End-to-End Verifiable Internet Voting, the U.S. Vote Foundation described in detail what is necessary to implement secure online voting. Hawaii could use the deep analysis within the report as a blueprint. Most experts acknowledge online voting as an inevitability. There is value in being on the cutting edge of it. Hawaii earned national attention over the past year for its adoption of a goal that 100 percent of our power needs be met via green sources by 2045. By moving forward now on automatic registration, voting by mail and online voting, we can show that we value leadership in the sustainability of participatory democracy just as highly.